The LF2 leaders Cavigal Nice started November in the way they left October with another victory to claim the top position in the division as the only team without a defeat. COB Calais's unbeaten on-the-road record was stopped while Angers won an explosive derby. Pau Lacq Orthez and US Laveyron also grabbed a victory this weekend. Julie Barennes made her L2F début in the "Loire" (Pays de La Loire) derby between Roche Vendée and Angers. As for derby matches it had everything from drama, suspense to officials in difficulty. For Sabrine Bouzanna, the game lasted a little over 14 minutes until she was ejected for a second unsportsmanlike foul. Based on some of the calls later in the game, she was unlucky to have received such a hard sanction. The match went all the way to the wire with Nadja Morgan from Roche Vendée tieing the game (55-55) with one minute to play. Barennes put Angers in front for good with 42 seconds to play. Then her side finished the game off from the charity stripes. In two other games US Laveyron pushed their way past Limoges (68-47) while Pau Lacq Orthez pulled themselves together after their hard loss in round 5 to beat the CFBB (65-44). Reims took on COB Calais in what was described as the game of the week because of the number of players from Calais that had played for Reims. However the hero of the match was a medical student who had spent three years at the youth academy at COB Calais, Maud Lesoudard (in picture). 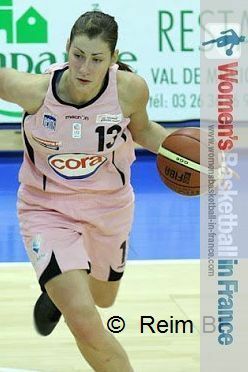 She had a perfect shooting day from the field and from the free-throw line while dishing out 3 assists to help Reims beat COB Calais (76-66). Reims' victory was based on real team basketball: Anais Jomby kept her team in the game during the first quarter by scoring her side's first 8 points. By the end of the match all nine players had got on the score sheet. Calais did not play badly. It was their finishing which was off while loosing hustle plays as well as their unbeaten record. The question in LF2 is who can stop Cavigal Nice. The answer is: not Dunkerque. However not many teams are going to hit 45% of their shot at the home of Cavigal Nice and lose by 14 points. Cavigal Nice were more accurate with 63% of their shots hitting the target. But it was the three-point shooting of Marie-Eve Paget, Margaux Galliou-Loko and Margaux Okou Zouzou (16 points) that made the difference in the end. No matter how good the youngsters at Cavigal Nice play it is always one of the senior members that gets them out of trouble. 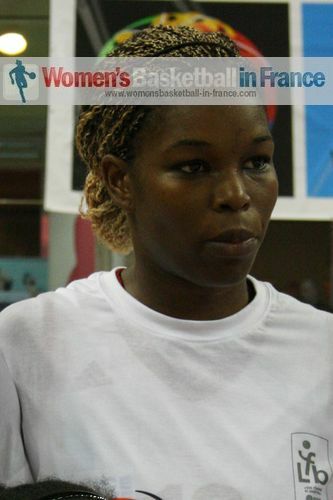 This weekend Fabienne Constant (in picture) helped herself to 23 points while Jeanne Senghor-Sy added 16 points.